We study the structure and properties of the chimera states in the ensembles of chaotic oscillators with nonlocal coupling. It is shown that the phase and amplitude chimera states in the ensembles of chaotic oscillators with nonhyperbolic and hyperbolic attractors can be obtained using the models in the forms of two-dimensional Hénon and Lozi maps. The mechanisms of birth, the structure, and the lifetime of the phase and amplitude chimeras and the regime of solitary states are studied. The chimera states in two coupled ensembles of chaotic maps are considered. The possibility of realizing a new type of the chimera structure, namely, the chimera consisting of the solitary states is demonstrated. The effects of the external and mutual synchronizations of the chimera states are described by an example of two coupled ensembles of logistic maps with nonlocal coupling. 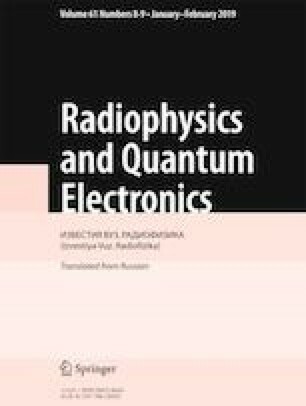 A qualitative analogy of the obtained results with the classical effect of synchronization of periodic self-sustained oscillations is discussed. Translated from Izvestiya Vysshikh Uchebnykh Zavedenii, Radiofizika, Vol. 61, No. 8–9, pp. 739–753, August 2018.